OTHER USES: This section contains uses of this drug that are not listed in the approved professional labeling for the drug but that may be prescribed by your health care professional. Use this drug for a condition that is listed in this section only if it has been so prescribed by your health care professional. This drug may also be used to treat and prevent ulcers in the stomach, and to prevent ulcers caused by the use of aspirin or other anti-inflammatory drugs (e.g., ibuprofen, naproxen). HOW TO USE: Take this medicine by mouth, usually 2 to 4 times daily, on an empty stomach at least 1 hour before a meal, or as directed by your doctor. The dosage is based on your medical condition and response to therapy. Use this medication regularly in order to get the most benefit from it. To help you remember, use it at the same times each day. It is important to continue taking this medication even if you do not feel ulcer pain. Do not stop taking this medication without consulting your doctor. It may take 4 to 8 weeks for your ulcer to heal completely. Sucralfate may react with other drugs taken at the same time, preventing their full absorption. It is best to take other drugs 2 hours before or after sucralfate to avoid drug interactions. Antacids can be used with this medicine, but they should be taken at least 30 minutes before or after sucralfate. Inform your doctor if your condition persists or worsens after you have been taking sucralfate for 4 weeks. SIDE EFFECTS: Constipation, dry mouth, upset stomach, gas, and nausea may occur. If any of these effects persist or worsen, notify your doctor or pharmacist promptly. Remember that your doctor has prescribed this medication because he or she has judged that the benefit to you is greater than the risk of side effects. Many people using this medication do not have serious side effects. Tell your doctor immediately if these unlikely but serious side effects occur: an unusual/persistent feeling of fullness in the stomach, nausea/vomiting/stomach pain especially after meals. A very serious allergic reaction to this drug is unlikely, but seek immediate medical attention if it occurs. Symptoms of a serious allergic reaction may include: rash, itching/swelling (especially of the face/tongue/throat), severe dizziness, trouble breathing. This is not a complete list of possible side effects. If you notice other effects not listed above, contact your doctor or pharmacist. In the US - Call your doctor for medical advice about side effects. You may report side effects to FDA at 1-800-FDA-1088. In Canada - Call your doctor for medical advice about side effects. You may report side effects to Health Canada at 1-866-234-2345. PRECAUTIONS: Before taking sucralfate, tell your doctor or pharmacist if you are allergic to it; or if you have any other allergies. This product may contain inactive ingredients, which can cause allergic reactions or other problems. Talk to your pharmacist for more details. Before using this medication, tell your doctor or pharmacist your medical history, especially of: kidney problems, difficulty swallowing, stomach/intestine problems (e.g., delayed gastric emptying), tube feeding. Kidney function declines as you grow older. This medication contains aluminum, which is normally removed by your kidneys. Therefore, elderly people may be at greater risk for developing high aluminum levels while using this drug with other products that contain aluminum (e.g., antacids). 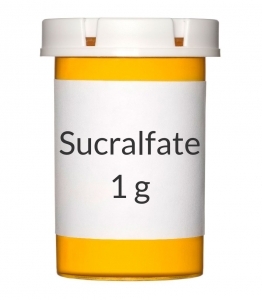 If you are pregnant, tell your doctor before using sucralfate. It is not known if this medication passes into breast milk. Consult your doctor before breast-feeding. DRUG INTERACTIONS: Your healthcare professionals (e.g., doctor or pharmacist) may already be aware of any possible drug interactions and may be monitoring you for them. Do not start, stop or change the dosage of any medicine before checking with them first. Before using this medication, tell your doctor or pharmacist of all prescription and nonprescription/herbal products you may use, especially of: antacids that contain aluminum, certain antibiotics (e.g., quinolones such as ciprofloxacin/levofloxacin/ofloxacin, tetracyclines), cimetidine, digoxin, ketoconazole, penicillamine, phenytoin, quinidine, ranitidine, theophylline, thyroid medications (e.g., levothyroxine, liothyronine). This document does not contain all possible interactions. Therefore, before using this product, tell your doctor or pharmacist of all the products you use. Keep a list of all your medications with you, and share the list with your doctor and pharmacist. NOTES: Your doctor may recommend some lifestyle changes such as stress-reducing programs, diet changes and exercise to assist in treatment and prevention of ulcers. Do not share this medication with others.